Stress exposure has been proposed to contribute to the etiology of breast cancer. However, the validity of this assertion and the possible mechanisms involved are not well established. 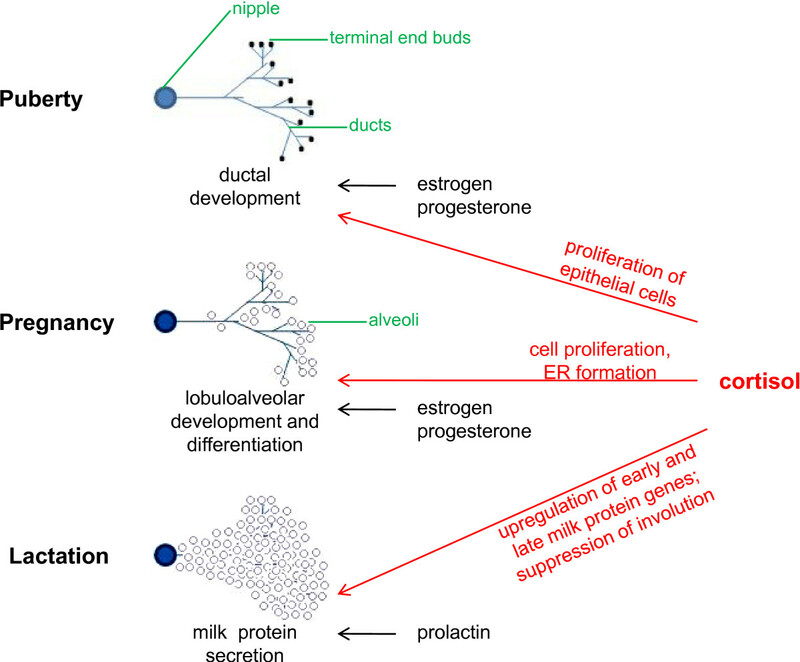 Epidemiologic studies differ in their assessment of the relative contribution of stress to breast cancer risk, while physiological studies propose a clear connection but lack the knowledge of intracellular pathways involved. The present review aims to consolidate the findings from different fields of research (including epidemiology, physiology, and molecular biology) in order to present a comprehensive picture of what we know to date about the role of stress in breast cancer development. Studies have estimated that approximately 50% of breast cancer incidence can be attributed to known genetic, physiologic, or behavioral risk factors , with genetic risk factors accounting for 5 to 10% of breast cancer cases . Established physiological and behavioral risk factors for breast cancer include having a first-degree relative with breast cancer, early menarche, late menopause, nulliparity or bearing of first child at a later age, overweight after menopause, certain types of benign breast diseases, alcohol consumption, and long-term use of menopausal estrogen replacement therapy . In addition to these well-characterized contributors, other factors, whose effects have been more difficult to evaluate, are suspected of conferring increased breast cancer risk. These factors include smoking, certain aspects of nutrition (meat and fat consumption), physical activity, and psychological stress [4, 5]. The possible contribution of psychological stress to breast cancer development has been extensively studied. Literature on the topic is not only abundant, spanning several decades, but is scattered between the fields of epidemiology, physiology, and molecular biology. Whereas the largest amount of literature focuses on using epidemiologic methods to look for a connection between exposure to stress and subsequent breast cancer diagnosis, this portion of the literature is also the most difficult to assess. Studies in this area differ greatly in their findings, probably due to differences in factors such as study design, the effects of confounding, type of stress exposure, and timing of stress exposure or stress exposure measurement. On the other hand, animal literature on the topic is simpler to interpret, for the most part pointing to a connection between physiological stress signaling and breast cancer development. This literature is limited, however, by a lack of variability in stress exposure parameters and the differences in breast physiology and development between mice and humans. Finally, molecular studies demonstrate a clear overlap between intracellular stress signaling and protumorigenic pathways within breast cells, but need to be integrated with other stress-breast cancer research in order to obtain an unambiguous assessment of the potential cause-effect relationship. In the present review, we provide a comprehensive picture of the current state of knowledge in the stress-breast cancer field. We shall first begin with epidemiology (which looks at the stress-breast cancer association in human populations) as the most directly relevant study of the human condition, will then continue with the physiological rationale behind a stress-breast cancer association, will present physiological research in this field (which examines the direct correlation between experimentally-induced stress and tumor development in animals), and shall end with molecular biology (providing the cellular mechanisms through which stress may contribute to breast cancer development). We will identify the sources of study discrepancy (in the case of epidemiology) or the gaps in knowledge (in the case of physiology and molecular biology) that should be addressed in order to further advance scientific understanding, and we shall discuss future research directions that would benefit from a multidisciplinary approach. English-language article and book sources from MedLine, PubMed, and PsycINFO were employed in the present review. The listed databases were searched for a large number of combinations of terms pertaining to the various fields referenced, but some general search terms included: stress or psychological stress (cross-referenced with terms from all fields, such as cancer, breast cancer, mammary gland, glucocorticoid receptor (GR), hypothalamic-pituitary-adrenal (HPA) axis, animal studies, apoptosis, DNA repair, immunity), cortisol, GR, HPA axis, mammary gland development, life events, animal studies and cancer. No publication date limits were set, but the publication dates for the sources included range between 1973 and 2010. Role of cortisol in mammary gland development. The role of cortisol is shown for the different post-embryonic developmental stages of the mammary gland. Other hormones involved in the different developmental stages are also listed. 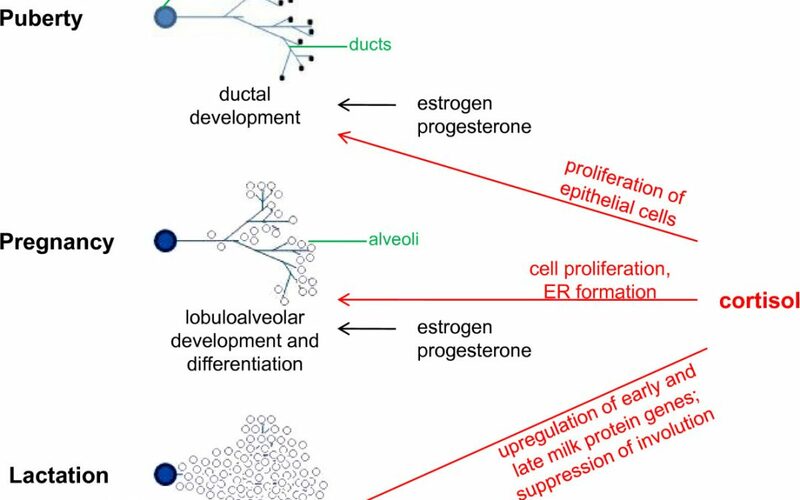 Estrogen and progesterone promote ductal system proliferation during puberty. However, the DNA binding function of the glucocorticoid receptor also appears to be required. During pregnancy, cortisol contributes to lobuloalveolar development of the mammary gland, in conjunction with estrogen and progesterone. Prolactin and cortisol prepare the mammary cells for lactation and stimulate milk protein production following parturition. In addition, cortisol contributes to the maintenance of lactation by suppressing involution. ER, endoplasmic reticulum. 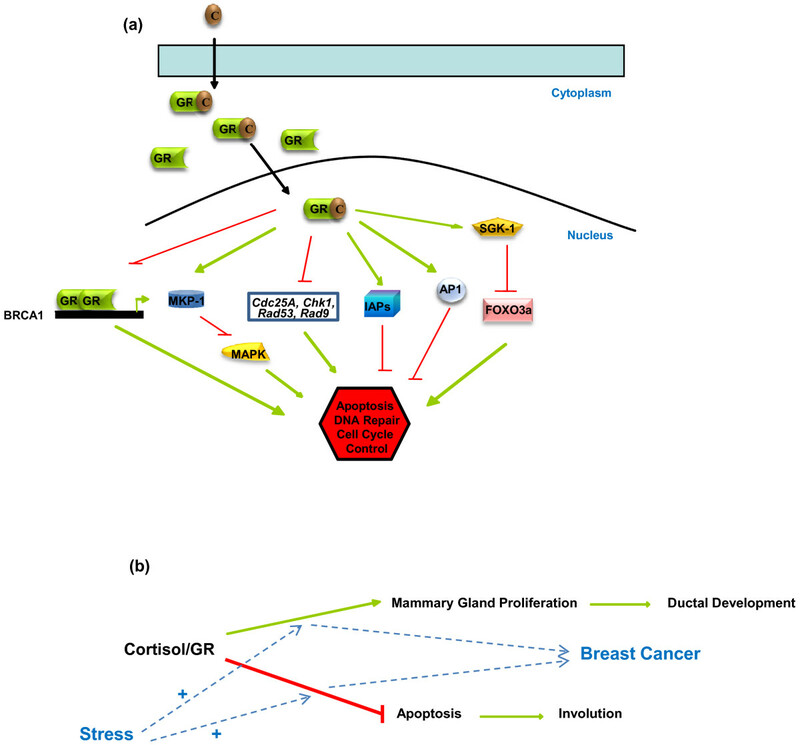 Mechanisms of stress signaling in breast cells and of stress-induced breast cancer development. (a) Mechanisms of stress signaling in breast cells. Stress-induced cortisol (C) binding to the glucocorticoid receptor (GR) causes translocation of the GR to the cell nucleus and changes in the expression of apoptotic and DNA repair genes. Some possible protumorigenic mechanisms include loss of GR transactivation at the breast cancer susceptibility gene 1 (BRCA1) promoter, stimulation of activator protein (AP)-1 transrepressing activities, activation of serum and glucocorticoid-regulated kinase-1 (SGK-1), repression of mitogen-activated protein kinase (MAPK) signaling, suppression of inhibitors of apoptosis protein (IAP) degradation, and modulation of the levels of DNA damage sensor and response proteins. Green arrows represent a positive effect, red lines represent a negative effect. (b) A model of stress-induced breast cancer development. The cortisol-activated GR stimulates mammary gland proliferation during development and represses involution. Prolonged presence of cortisol, such as in periods of stress, leads to an increase in both the proproliferative and antiapoptotic effects of the receptor creating transformation-promoting intracellular conditions. FOXO3a, Forkhead transcription factor 3a; MKP-1, mitogen-activated protein kinase phosphatase-1.